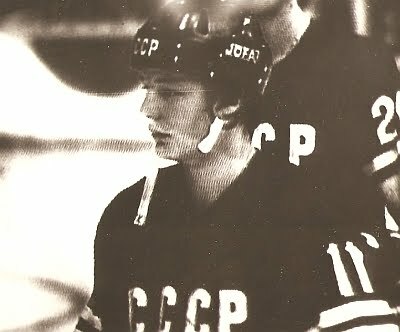 Soviet Union center and two-time Olympic gold medalist VLADIMIR SHADRIN (19) of Spartak Moscow, who was later permitted by officials to skate several seasons abroad in Japan, scored 45 goals in 71 games for the U.S.S.R. national team while appearing at ten major international tournaments in his career. 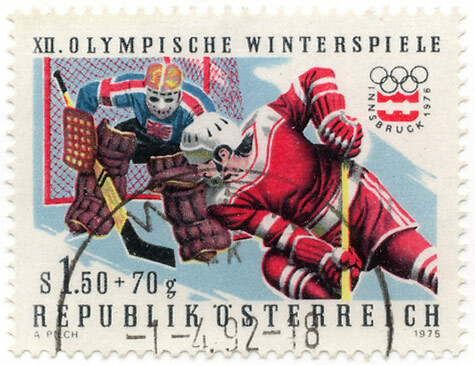 And so, one final qualification match for the ice hockey tournament at the 1976 Winter Olympic Games was yet to be contested at the Olympiahalle in Innsbruck. 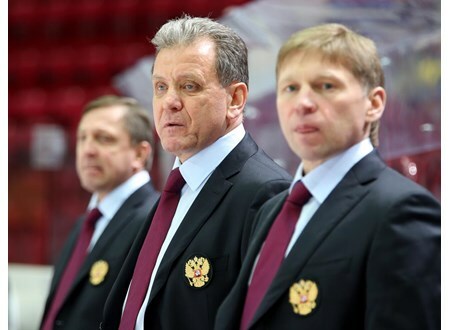 The mighty, three-time defending Olympic champion champion of the UNION of SOVIET SOCIALIST REPUBLICS were scheduled to meet host nation AUSTRIA, who had been under the direction of a one-time Soviet Olympian for the past few seasons now. Despite this factor in addition to the home ice advantage, however, Austrian prospects for a shocking result were, realistically, non-existant. Once upon a time, Austria fielded a competitive national team that claimed European titles in both 1927 and 1931. 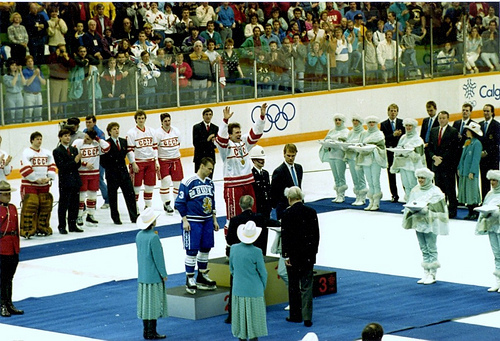 The Austrians also earned bronze medals at the annual IIHF World Championships in 1931 and again following the Second World War in 1947 but started to decline even before the Soviet Union began entering international ice hockey tournaments in the mid-1950s. 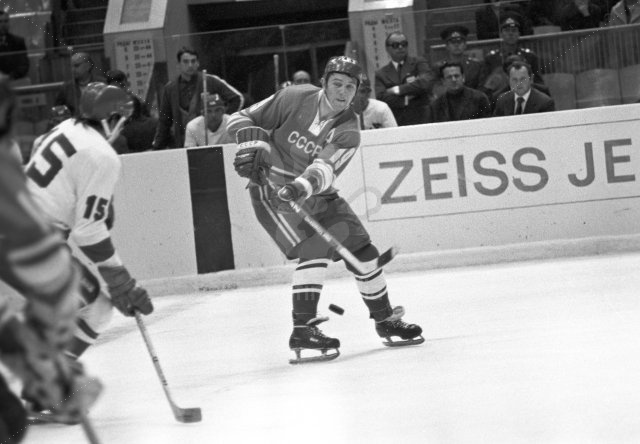 Austria were already regular B Pool contestants by the start of the 1960s and were soundly defeated by Finland 8-2 on home ice at the Olympiahalle in Innsbruck during the qualification round of the 1964 Winter Games. 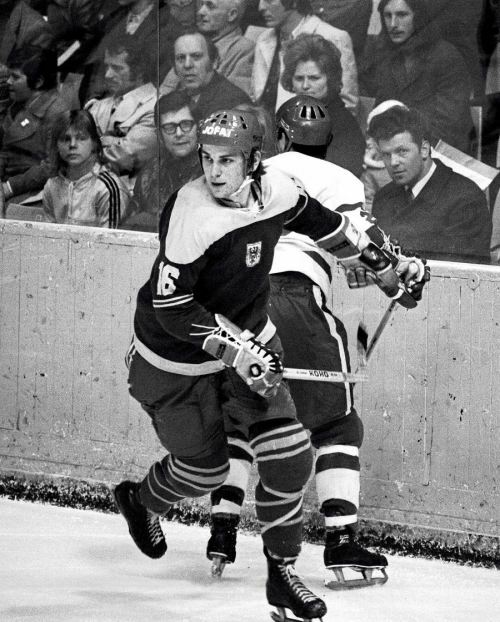 YURI BAULIN, who spent 10 seasons playing both center and defense for the powerhouse army club CSKA Moscow while earning a bronze medal with the U.S.S.R. squad at the 1960 Winter Olympics at Squaw Valley, had taken the reins of the Austria national team to begin the 1973/74 campaign. 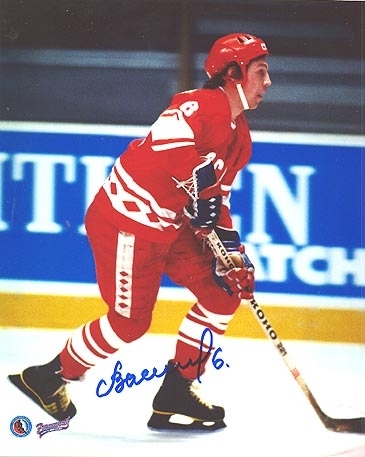 But at the B Pool of the 1974 IIHF World Championships in Ljubljana, Yugoslavia, the Austrians ended up last in the standings and, thus, were demoted to the C Pool where they would only finish a disappointing third at Sofia in Bulgaria a year later. Nevertheless, Baulin was also brought on board by AC Klagenfurt to begin the 1974/75 season and succeeded in steering the club to the Bundesliga title in his second term there. Austria center FRANZ VOVES (16) of ATSE Graz, who appeared at seven World Championships in addition to the 1976 Winter Olympics while skating 75 contests with the national team of Oesterreich in his career, later went into politics and has been the Landeshauptmann der Steiermark (the Governor of the Austrian State of Styria) since 2005; Voves, along with Soviet player/coach Viktor Kungurtsev, claimed a Bundesliga title with ATSE Graz in 1975. 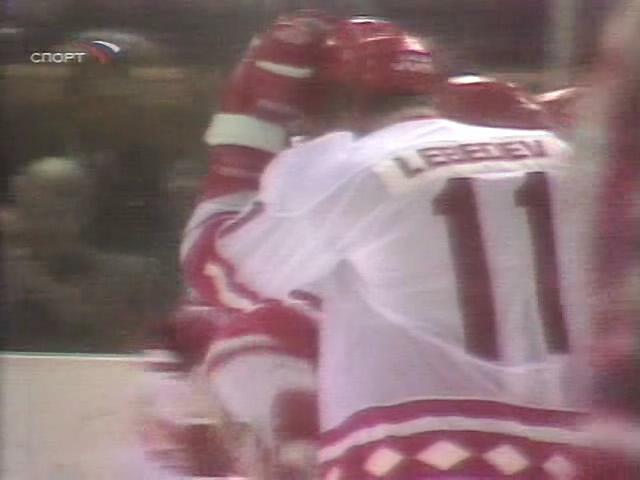 As expected, the Soviets ended up steamrolling their hosts at the Olympiahalle in Innsbruck. Oddly enough, it was the Spartak Moscow forward line of left wing ALEXANDER YAKUSHEV, center VLADIMIR SHADRIN and right wing VIKTOR SHALIMOV who scored the first three goals less than ten minutes into the qualfication match against the Austrians. Baulin, of course, had been the trainer for the talented Spartak troika during the 1971/72 campaign in the Soviet Supreme League. In fact, the Spartak combination would account for seven goals, alone, at the Olympiahalle with Shadrin leading the way with four tallies, himself. 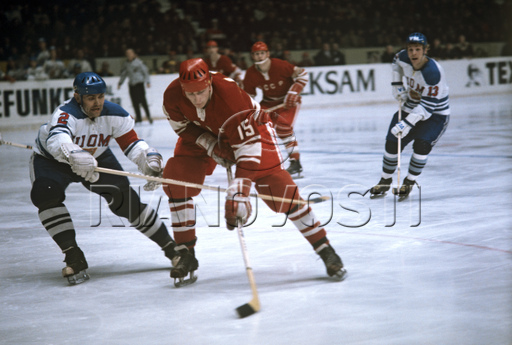 SERGEI KAPUSTIN, the soon-to-be 23-year-old from Soviet Wings, added to Austrian woes by recording the hat trick while Shalimov, the veteran Dyanmo Moscow right wing ALEXANDER MALTSEV and CSKA Moscow center VLADIMIR PETROV all scored two goals, apiece. 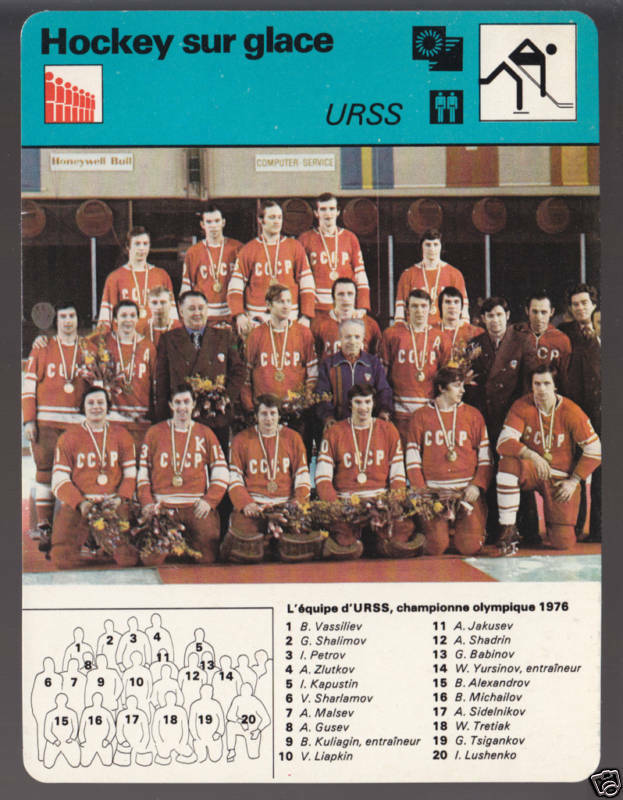 Altogether, eight different Soviet skaters put their names on the scoresheet as the U.S.S.R. completely overwhelmed Austria 16-3 in Innsbruck. Notice of serious intent to remain Olympic champion had been served. The four-times consecutive Olympic champion squad from the UNION of SOVIET SOCIALIST REPUBLICS pose for a proper team photograph just after being awarded the coveted set of gold medals by I.O.C. 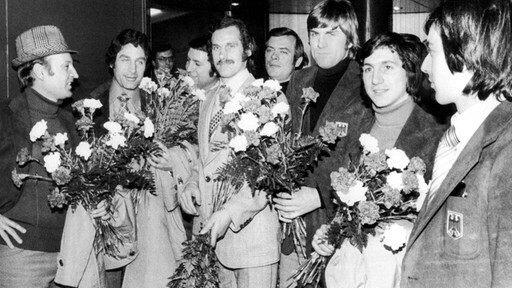 big-wigs during the official ceremony for the 1976 Winter Games ice hockey competition at the Olympiahalle in Innsbruck, Austria. 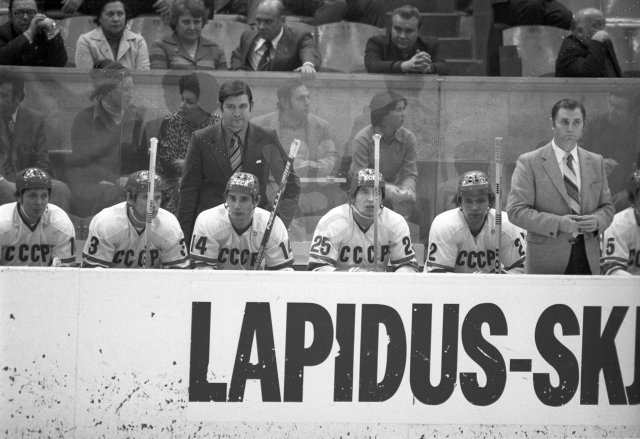 For the very first time ever at the Winter Olympics, the ice hockey team of the U.S.S.R. at the ’76 Innsbruck Games was not steered by ANATOLI TARASOV, the legendary “Father of Soviet Hockey” who had been replaced as trainer of the national team after the 1972 Winter Olympics in the wake of a dispute with the powers that be in the Soviet Sports Committee over cash bonuses. 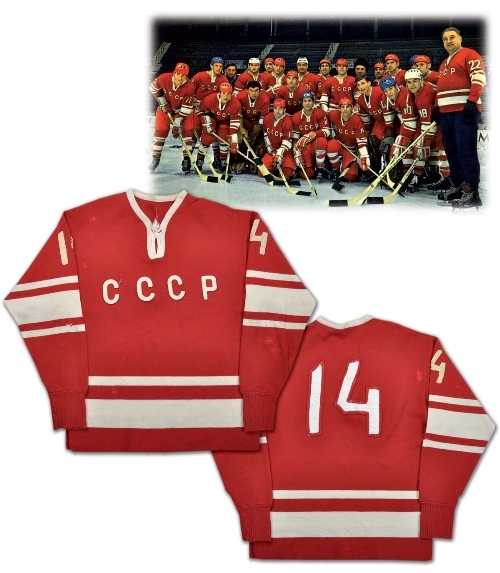 It was, of course, BORIS KULAGIN of the Moscow-based Soviet Wings (Krylya Sovetov) club who had been in charge of the U.S.S.R. national side ever since his appointment ahead of the 1974 IIHF World Championships. 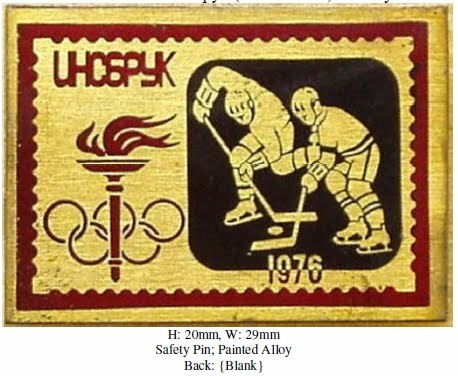 But the listing for the above photograph is inaccurate, then, as the coach assisting Kulagin was actually KONSTANTIN LOKTEV of CSKA Moscow, who had taken over the powerhouse army club from Tarasov to start the 1974/75 hockey season. 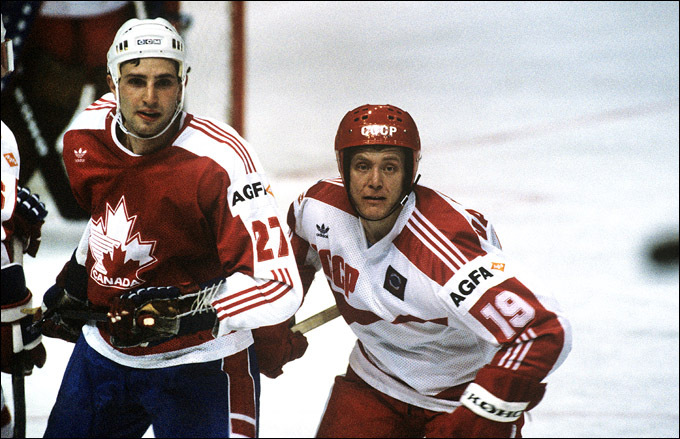 Both Kulagin and Loktev had taken their Soviet domestic clubs on the historic tour of North America to face professional National Hockey League teams just a couple of months prior to the 1976 Winter Olympics in Austria. 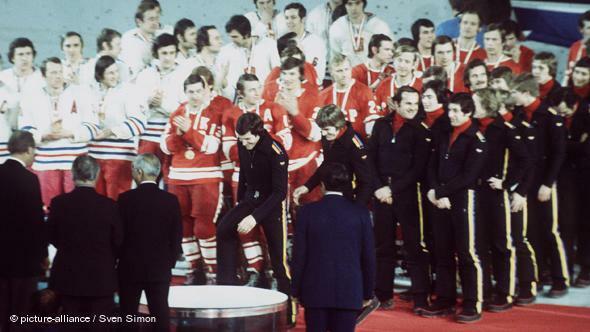 All of the gold medal-winning Soviet players at the ’76 Innsbruck Games had also participated in that landmark meeting with the NHL clubs. 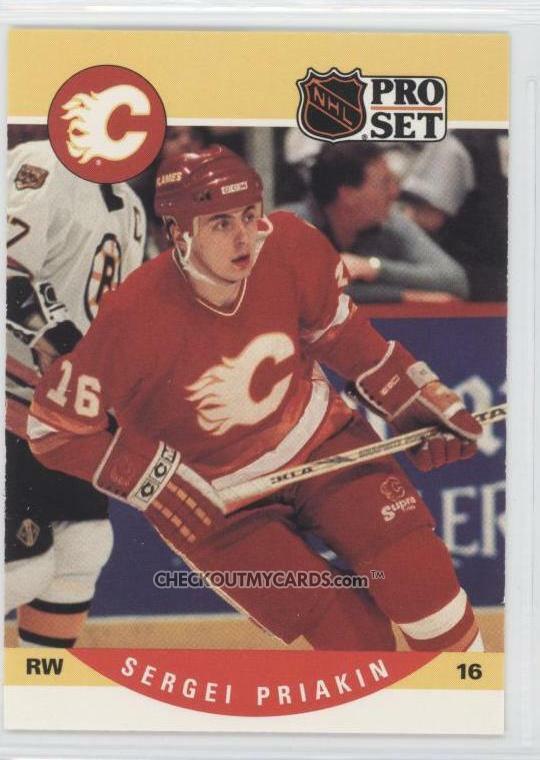 Gold medalist BORIS ALEXANDROV (11) of CSKA Moscow was one of a only a very select few of all the Olympic ice hockey players from the Union of Soviet Socialist Republics who was not Russian. 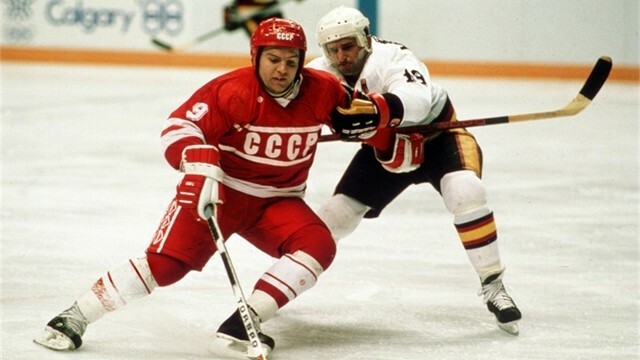 After the fall of the old U.S.S.R., the 20-year-old winger who had begun his senior career in the Soviet system with Torpedo Ust-Kamenogorsk was later appointed the national team trainer of his native Kazakhstan. 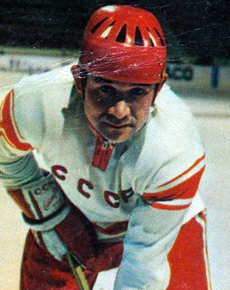 Alexandrov was the only skater for the Soviet Union not to appear in the de facto Gold Medal Match with Czechoslovakia on the final day of ice hockey competition at the 1976 Winter Games at Innsbruck. 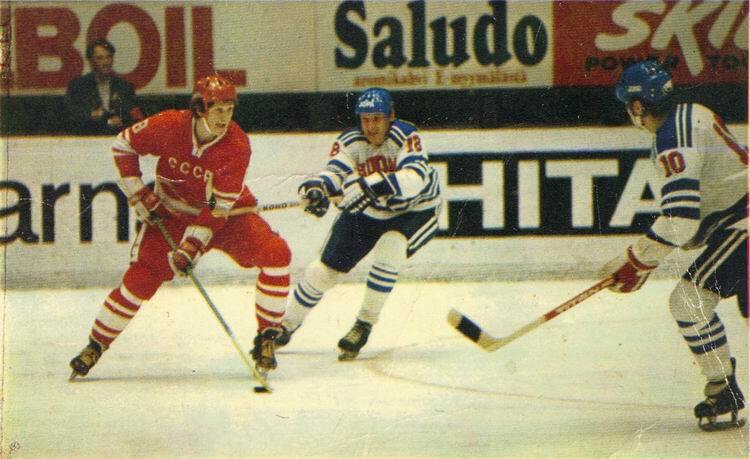 26-year-old defenseman VALERY VASILIEV (6) of Dynamo Moscow, who appeared at the Olympics for the Soviet Union three times in his distinguished career and before captaining the 1981 Canada Cup champion team, did much to solidy the U.S.S.R. blueline during the 1976 Winter Games hosted by Innsbruck, Austria. 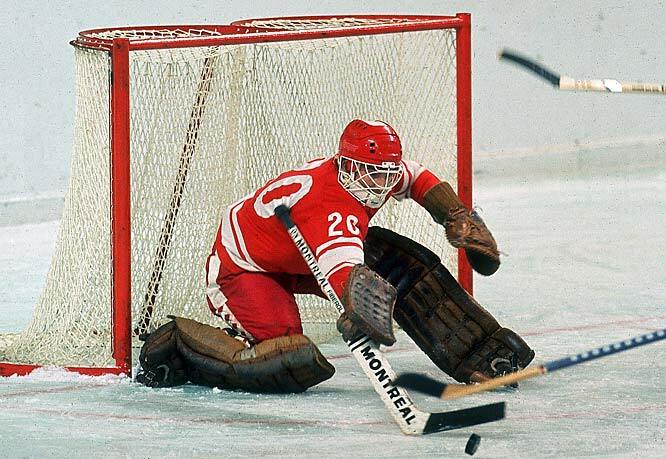 Soviet Union goaltender VLADISLAV TRETIAK (20) of CSKA Moscow, one of nine returning players from the title-winning team at the 1972 Sapporo Games, scored the second of what would be a hat trick of Olympic gold medals over the course of his accomplished career with strong work between the pipes for the U.S.S.R. at the 1976 Winter Games hosted by Innsbruck, Austria.